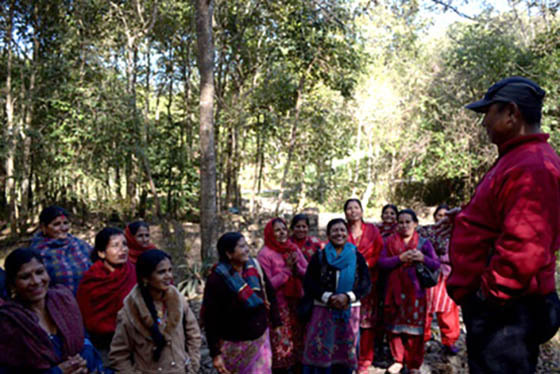 A group of 27 woman farmers from Panchkhal Lamidihi visited ICIMOD’s Godavari Knowledge Park on 22 December 2013 to learn about innovative technologies related to soil and water management as well as energy and income generating activities. Earlier, staff from ICIMOD’s Water and Air Theme had visited Panchkhal area to study the long-term impacts of ICIMOD’s PARDYP project which was operational in the area till 2005. During the course of this field visit, a group of women farmers specifically requested the ICIMOD team to facilitate a visit to Godavari Knowledge Park. The group showed great interest in all the technologies that were demonstrated at the Park. Asked to prioritize based on applicability in their day-to-day lives, they chose rainwater harvesting technologies, ground apple farming, improved variety of goat, bee hive, bio briquette, and water lifting technology as most useful to them.